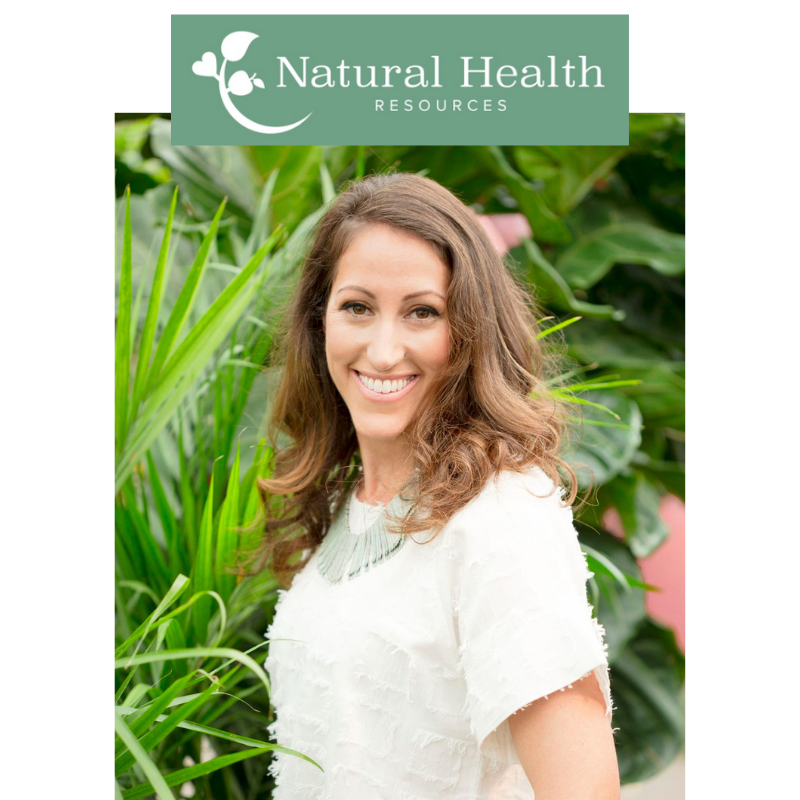 We are partnering with Natural Health Resource to offer the channel’s subscribers an exclusive promotion, with big savings $$$. With any purchase of an EnviroKlenz Mobile Air System or EnviroKlenz Mobile UV Model, you will receive an additional 3 replacement air cartridges for your system (a $300 value) included in your purchase. Purchase now to receive this exclusive discount! The EnviroKlenz Mobile Air Systems combine a patented EnviroKlenz technology and HEPA filtration to provide “adsorptive neutralization” and removal of a broad spectrum of airborne contaminants such as chemicals, fragrances, VOCs, odors, pollen, dust, mold, allergens, bacteria, and more through the use of environmentally safe and fragrance-free materials. The Mobile Systems Promotion is priced at a one-time offer of $650 for the EnviroKlenz Mobile System and $799 for the EnviroKlenz UV Model. These price include an EnviroKlenz Mobile Air System or EnviroKlenz Mobile UV Model with HEPA filter and EnviroKlenz Filter with 3 free additional EnviroKlenz replacement filters. ✓ An easily installed EnviroKlenz-Air Cartridge contains a proprietary blend of materials to neutralize odors, chemicals, gasses, Volatile Organic Compounds (VOCs), and larger particulates. ✓ No tools are required for unit maintenance. ✓ A multi-speed blower offers quiet and efficient airflow. The low setting allows for near silent operation while still maintaining odor elimination. 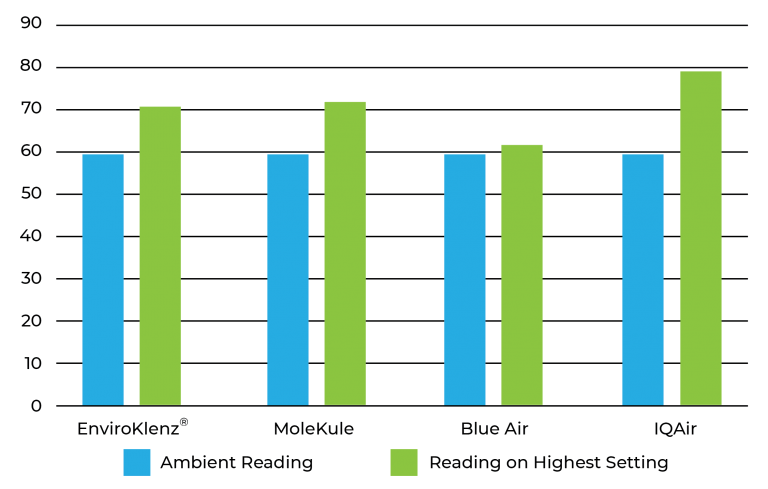 Medium to High speeds creates maximum air efficiency at noise levels still suitable for residential and commercial use. In the chamber study to the right, hydrogen sulfide was released in an environmental chamber under ambient conditions. The various air systems and technologies were remotely controlled to not disturb the environment. The EnviroKlenz Air System rapidly reduced and neutralized the acidic gas from the air. The IQAir system which utilizes a significant amount of an activated carbon did remove the H2S from the air, but since carbon is not reactive, there is the potential for the hydrogen sulfide to be released back to the atmosphere with changes in temperature, pressure, and or humidity levels. The Blue Air purifier utilizes HEPA filtration and only some physical absorption of the acid gas on the HEPA filter was observed. The Molekule system did not rapidly remove the hydrogen sulfide and a bare carbon filter did not absorb or adsorb the acid gas. The IQAir uses a carbon filter that contains well over 5 pounds of media. The EnviroKlenz Air Cartridge is able to achieve the same results with less than ½ pound of media! This means fewer change-outs and money spent on replacing carbon filters. In this chamber study below, ammonia was released in an environmental chamber under ambient conditions. The various air systems and technologies were remotely controlled to not disturb the environment. The EnviroKlenz Air System rapidly adsorbed the ammonia gas from the air. The IQAir system which utilizes a significant amount of an activated carbon did remove the ammonia from the air, but since carbon is not reactive, there is the potential for it to be released back to the atmosphere with changes in temperature, pressure, and or humidity levels. The bare carbon filter had minimal absorption of the ammonia. The Blue Air purifier utilizes HEPA filtration and only some physical absorption of the ammonia on the HEPA filter media was observed. The Molekule system did not remove or breakdown the hydrogen sulfide in the test. In this study, we utilized the IQAir system with the carbon filter and subjected it to VOCs in an environmental chamber. The temperature in the chamber at the beginning of the study was 72 degrees Fahrenheit. The VOC compound released and allowed to equilibrate. The air system was turned on and allowed to clear the chamber bringing the VOC to 0 ppm. 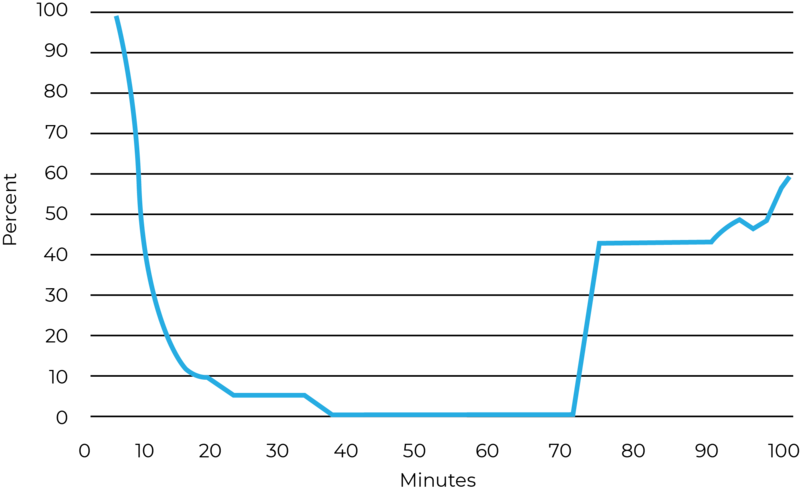 The system continued to run and then at 48 minutes, the temperature in the chamber was increased. By 58 minutes, the temperature had risen to 74 degrees and at 70 minutes the temperature was 78 degrees and the VOCs were rapidly off-gassing from the system. At the 90-minute mark, the VOC level had returned to the 50% level from the start of the experiment. This illustrates one of the significant drawbacks of absorption-only technology. Changes to the environment can negatively impact the performance of the system. 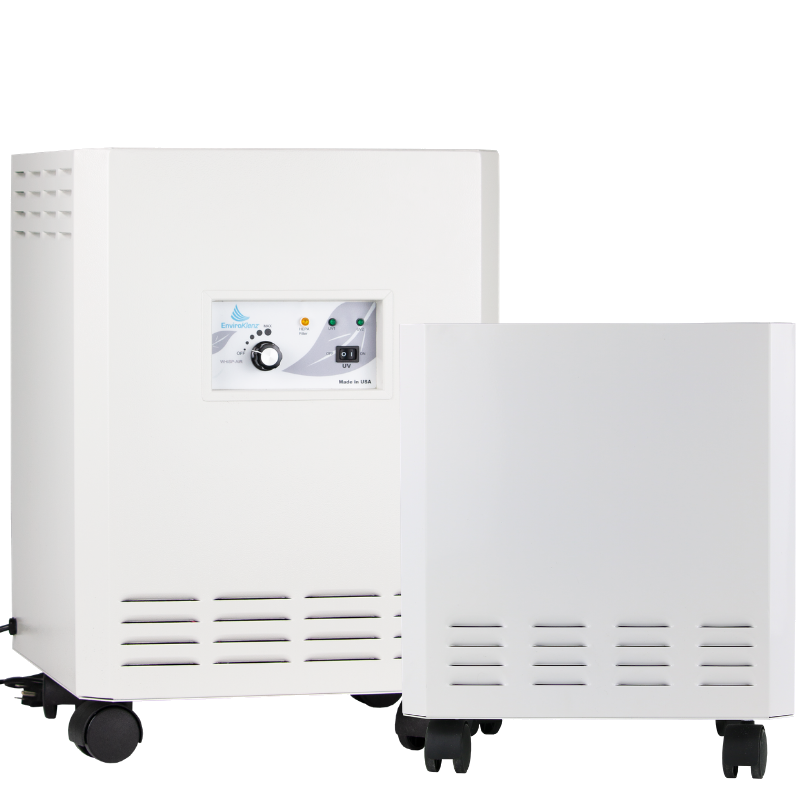 EnviroKlenz Air System uses a HEPA filter that has more square feet of media when compared to the ones used in the IQAir and the BlueAir. The MoleKule does not have a HEPA filter, so the square feet of the prefilter was used for this comparison. 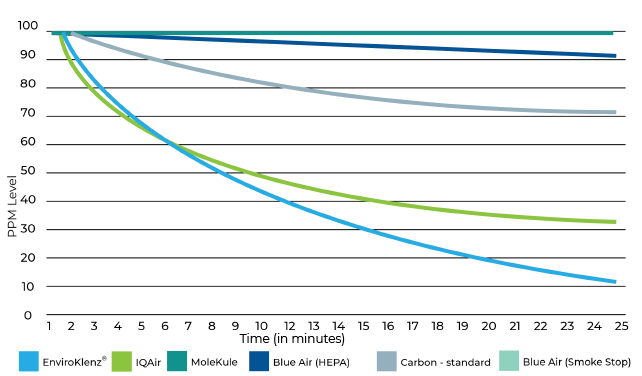 The prefilter, in addition to the having fewer square feet of media, is also significantly less efficient at removing particulates when compared to HEPA or better filters of the EnviroKlenz, IQAir and BlueAir systems. MoleKule particle filter has around 3 square feet of particulate filter media. The more square feet of particulate matter media results in a filter that can capture more particulate matter before needing to be changed. Testing was conducted in a quiet room 30′ (L) x 12′ (W) with 9′ (H) ceiling height. Ambient room reading was taken from the center of the room. The air systems were located along the center of the 12-foot measurement dividing the room in half along the width and 10 feet from the back wall. This spacing allows for 1- and 2- meter measurements from the unit along the length of the room. 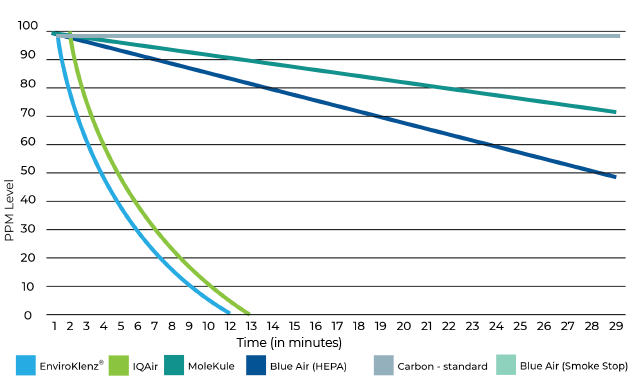 The cost to operate based on continuous use, 0.12 kw/h, and system run on the highest setting. When it comes to installing and maintaining your air purifier not all air systems are created equal! 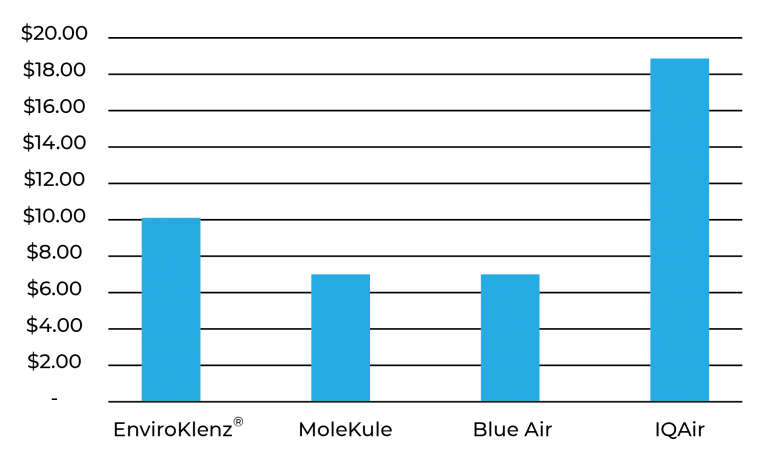 How easy is it to set up the EnviroKlenz Mobile Air System and how does it compare to the competition? 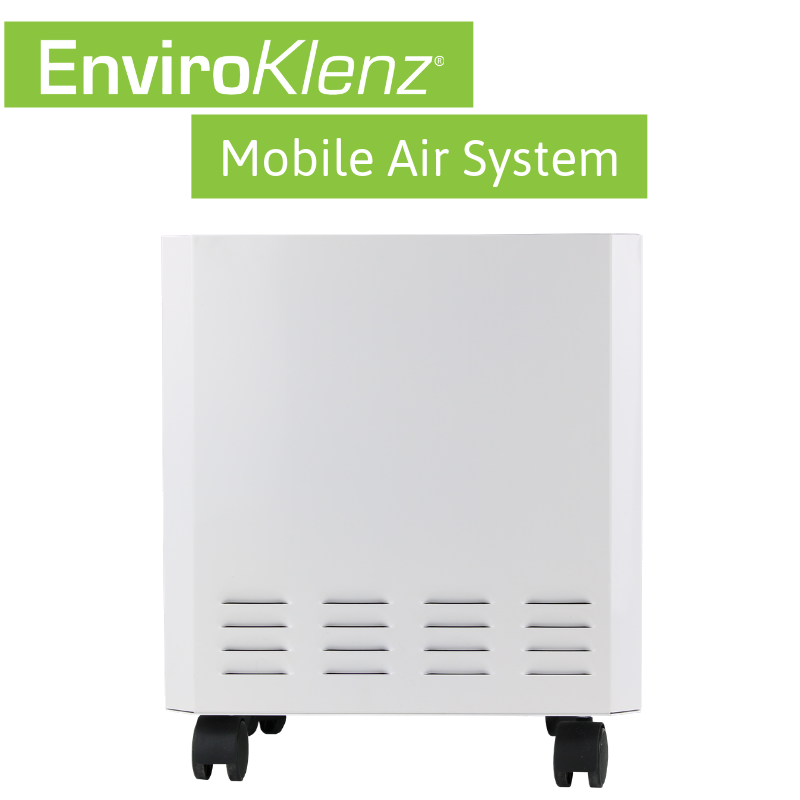 Do you want to get this exclusive EnviroKlenz Mobile Air Systems Promotion? 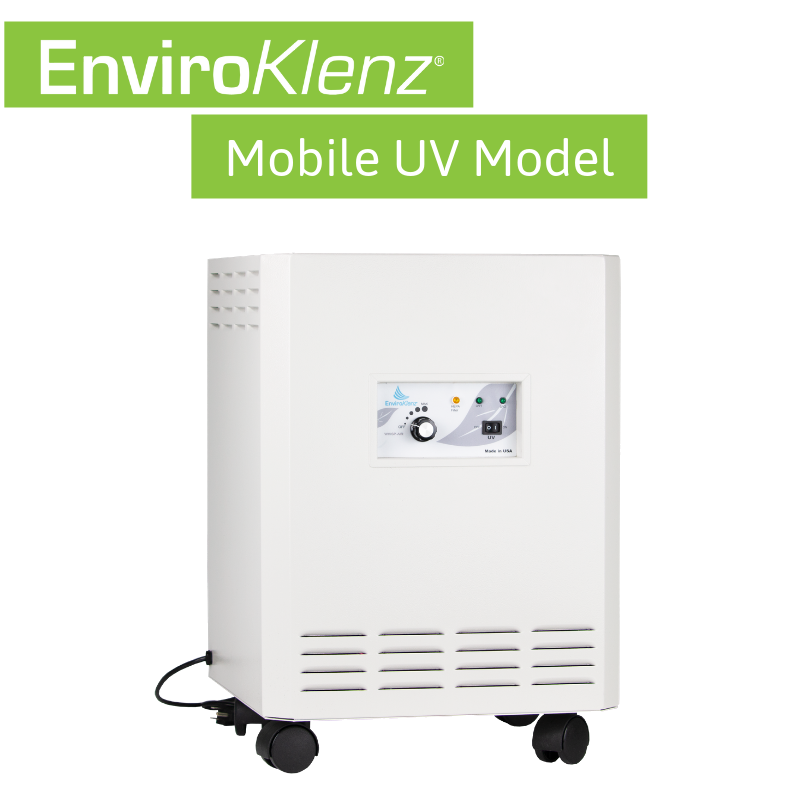 Click below to purchase the EnviroKlenz Mobile Air System or EnviroKlenz Mobile UV Model with the bonus filter deal! The smell of paint was gone by the next day and now I feel safe smelling the air in my house. The unit has turned out as advertised. It is quiet, efficient, and works magnificently. This unit has really made a difference in the air quality in spite of our challenges in moving into a brand new home having allergies and MCS. The EnviroKlenz Mobile should be the only choice for those with chemical sensitivities. The unit isn’t the prettiest but it is by far the best unit I have ever owned ( I must own 14+ units). I was amazed at how fast it was at removing chemically reactive gases such as formaldehyde, ammonia, and those found in new carpet or flooring. So far it is working well and the air in our bedroom smells so sweet and clean! I have had my EnviroKlenz Air Purifier for a week now and so far the results have been amazing! I had our home remediated for mold and was told by our contractor this is all that he would recommend . The air feels much fresher and I don’t fear what is in my air anymore. I bought this to combat the poisons that were being spewed into my home from our toxic neighbor’s fireplace. It works very well, and very fast! Way better than the Big Blue Air I have, and the filter replacement is far more affordable and easier to maintain. I love this thing so much! I wish I could put one in every room. This is a Godsend! My obsession for fresh, clean smelling air has put me on a quest to find the quietest and most efficient air purifier and I have finally found it. I have tested all the other major-“big brands” and they are just dust collectors. This machine really does what it advertises to do at removing the toxic gunk in your air and have it smell like you are breathing fresh country air. I have the filter in my home, office, and son’s school. One of the biggest differences I notice is that we all sleep better when the filters are running. All EnviroKlenz Mobile purchases include a 30-day money back guarantee. If for any reason you are not completely satisfied with your order, you may call the Customer support line at 239-331-5711 or email us at Custserv@timilon.com.If you are unsatisfied with your purchase for any reason in the first 30 days of your order, you may request a full refund of your purchase. Check out the resource links below to learn more about the EnviroKlenz Mobile Air Systems and the EnviroKlenz technology!